A year before, in 2006, I had lost both my mother and my grandmother within months. The fact that both of them were named after Mother Mary, and that my grandmother left behind a picture of little Bernadette kneeling before Mother Mary at the grotto in Lourdes pointed my way to the sacred site. In my state of grief, Lourdes was calling out to me with the promise of Motherly love. The summer of 2007, I arrived at Lourdes, at the foothills of the Pyrenees, with a heart palpitating with both excitement and anxiety. It was hard not to gasp in fear at my first sight of the mountains looming in the background. I almost regretted planning to trek over the Pyrenees on my 600km walking pilgrimage from France to Santiago in Northern Spain. But the pain of loss and emotional emptiness within me demanded that I conquer this feat, perhaps to balance the equation with matching physical discomfort and spiritual anguish. Lourdes became a natural sanctuary for my inner preparation before I embarked on my pilgrimage on foot. 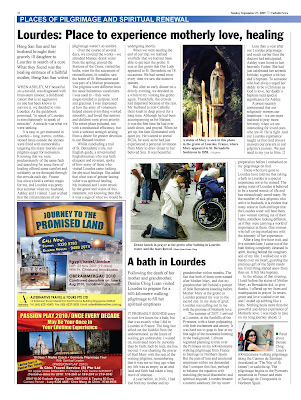 Those who have gone to Lourdes have told me that taking a bath in Lourdes is a special experience not to be missed. The spring water of Lourdes is believed to be a sacred source of life and has miraculously cured many. By the number of sick pilgrims who arrive in busloads, it is evident that many come in faith and hope that the Lourdes water will heal them. I saw women coming out of their baths, somehow looking different, as if they were carrying a world of importance in them. One woman who left crying marked me with the intensity of her experience. After a long five-hour wait, and five minutes later, I came out of the bath feeling completely cleansed in spirit, leaving behind the imaginary soil of my life. I walked out with hands over my heart, guarding the precious gift of the Spirit inside me. Everything started anew from then on. It felt like baptism. In the silence of that evening, I knelt before the statue of Mother Mary, as Bernadette did, to give thanks. I offered up my fears and inadequacies in prayer. In return, grace and love washed over me, and I ended up sobbing like a baby. Nothing heals more than the powerful and direct experience of Motherly love. I was ready to take on my long journey ahead. To read blog posts written during the 600km Pilgrimage, you can begin here.